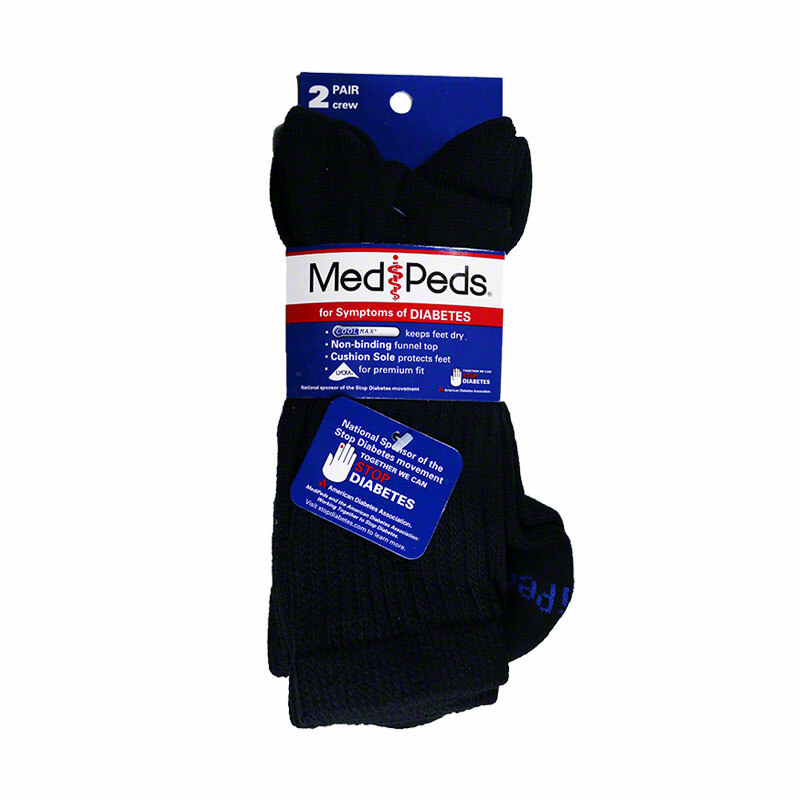 MediPeds diabetic crew socks are non-binding for sensitive legs and ankles. The extra-wide funnel tops reduce pressure on legs and ankles and the soft cushion soles and smooth toe seams prevent foot irritation and abrasion. Coolmax pulls moisture away from skin to keep feet dry and blister-free. 2 black pairs. MediPeds diabetic crew socks are non-binding for sensitive legs & ankles. The extra-wide funnel tops reduce pressure on legs and ankles and the soft cushion soles and smooth toe seams prevent foot irritation & abrasion. Coolmax pulls moisture away from skin to keep feet dry and blister-free. 2 black pairs. The socks fit my feet, but were too tight on my calf which caused pain and discomfort for hours. My mom (not diabetic) has large legs, making it impossible to find comfy socks that stay up. These really work! They're soft, stretchy and stay put! Love them! This is the only brand I will buy! Great socks for this diabetic!!! I’m not diabetic but I love comfortable socks. These socks don’t have a bothersome seam at the toe line. They are very soft, yet they are sturdy. I have been washing the same 2 pairs for nearly a year and they look like new. I ordered a medium and my women’s shoe size is 9. They fit perfectly. They are a little thicker than you would like for dress clothes but I am a nurse and they are perfect with scrubs. Love these comfortable socks but they are just a little thicker than I would like. Great product, sensibly priced .. However, wish you also had Navy in colors offered ..